Vatican City, St Peter’s Basilica and Sistine Chapel | Let's Go for a Trip! Vatican City is an independent country within the city boundaries of Rome. It is the smallest internationally recognized independent state in the world in terms of both area (44 hectares) and population (800 plus). Vatican City is ruled by the Pope and its economy is supported by the sale of postage stamps, tourist momentos, museum admission fees and the sale of publications. Admission Ticket permits entrance to the Vatican Museums and the Sistine Chapel. Open from Monday to Saturday, 9am to 6pm. Note that ticket office close at 4pm. Close on Sundays except the last Sunday of every month where it is free entrance from 9am to 12.30pm. 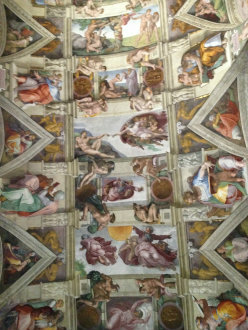 The Sistine Chapel is renowned for the frescos that decorated the interior, most particularly the ceiling and The Last Judgement painted by Michelangelo. 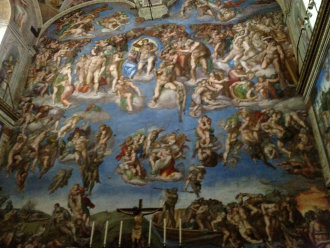 Michelangelo painted the ceiling between 1508 and 1512, and The Last judgement between 1535 and 1541. 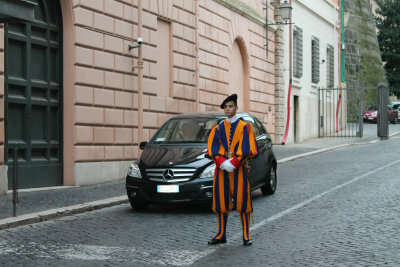 The Swiss Guards are Swiss soldiers who served as guard at foreign European courts since the late 15th century. The small force (110 men) are responsible for the safety of the Pope, and the security of the Apostolic Palace (the official residence of the Pope).Only single, Catholic males with Swiss citizenship and has completed Swiss military training can apply to be a Swiss Guard.